My love for homemade doughnuts is inexpressible. I have always had a secret not-so-secret obsession for these sweet confections. Whether raised doughnuts with a sweet chocolate glaze, french crullers, cake doughnuts with a crumb topping, churros, or small bite-size doughnut holes tossed in powdered sugar or filled with fruit preserves (or both! ), I cannot get enough of doughnuts. And neither can my friend, Lara Ferroni, who wrote an entire cookbook centered around-yes, you’ve got that right- doughnuts! When my copy of Doughnuts came in the mail. I couldn’t help express my love for the entire book to Lara. My younger sister who can barely boil water was even surprised as to how amazing the book was- the photography, the writing . . . everything (check out the trailer!). I was given permission to share a couple of recipes with you today. I honestly didn’t know what I wanted to share today. I made three recipes from Lara’s Book and took photos for each recipe. I made the apple cider doughnuts, the French crullers (I have an obsession with these things! ), and of course- these lovely glazed doughnuts. Yesterday, when I decided that posting not-so-nice photos of the first two recipes would not be a good idea at all. Especially when my family didn’t leave a crumb for me to photograph. Jerks. So . . . I decided to try another recipe from the book. Raised doughnuts. And boy, do they pack a lot of flavor and character. When I rolled out the dough, I made more doughnut holes than regular sized doughnuts because well- I like tossing the freshly fried doughnut rounds in a little powdered sugar. I didn’t share any of those with my family, just in case you were wondering. My stomach thanked me. The dough for this recipe can be made by hand, but expect a nice workout after you’re done making the dough. 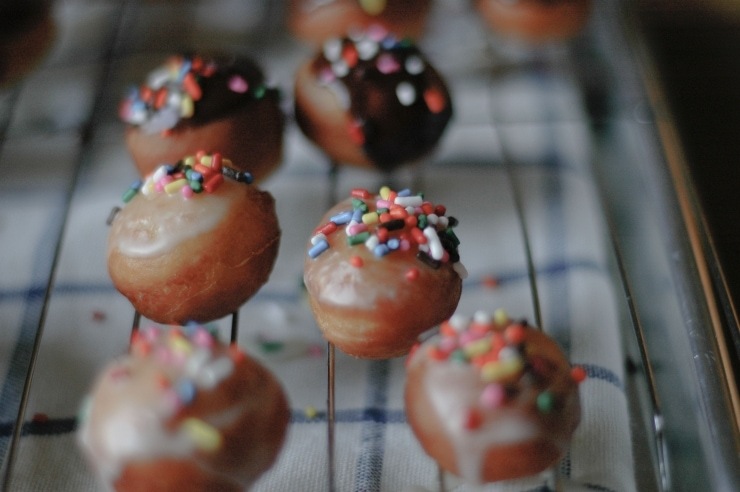 For a touch that brings you back to your childhood, glaze the doughnuts and immediately place some sprinkles on top. You’ll thank me. **You can use granulated sugar, just follow the weight measurement or heap the two tablespoons. 1. In a medium bowl, dissolve 2 tablespoons of yeast into ¾ cup of milk. Add ¾ cup of flour and stir to create a smooth paste. Cover the flour mixture and let rest in a warm spot for 30 minutes. 2. Combine ¼ cup of room-temperature milk and 1 tablespoon of yeast in the bowl of a stand mixer fitted with the paddle attachment. Add the rested flour mixture (from step 1) along with the sugar, salt, vanilla, and egg yolks. Mix until smooth. Turn off the mixer and add ½ cup of the remaining flour. Mix on low for about 30 seconds. Add the butter and mix until it becomes incorporated, about 30 seconds. Switch to a dough hook and add more flour, about ¼ cup at a time with the mixer turned off, kneading the dough at medium speed between additions, until the dough pulls completely away from the sides of the bowl and is smooth and not too sticky. It will be very soft and moist, but not so sticky that you can’t roll it out. You may have flour left over. Cover the bowl with plastic wrap and refrigerate for at least 1 hour (and up to 12 hours). 3. 20 minutes before taking the dough out, heat a heavy bottomed pot with at least 2 inches of oil until a deep-fat / candy thermometer registers 360ºF. 4. Line a baking sheet with a lightly floured non-terry dish towel. Roll out the dough on a slightly floured surface to ½ inch thick. With a doughnut or cookie cutter (can use a glass, too) cut out 3-inch-diameter rounds with 1-inch-diameter holes (if you plan on filling the doughnuts with preserves, don’t cut out the holes). 5. Place the doughnuts on the baking sheet at least 1 inch apart and cover with plastic wrap. Let sit in a warm spot to proof until they almost double in size, 5 to 20 minutes (kamran note: it took about 5 minutes for mine to proof), testing at five-minute intervals. To test whether the dough Is ready, touch lightly with a fingertip. If it springs back immediately, it needs more time. If it springs back slowly, it is ready. If it does not spring back at all, it has overproofed; no worries- you can punch it down and re-roll it once. 6. Once the doughnuts have proofed, using a metal spatula, carefully place the doughnuts in the oil. Fry for 1 to 2 minutes per side (for the doughnut holes, it might be less than 30 seconds a side, so keep an eye on them! ), or until golden brown. Remove with a slotted spoon, drain on a wire rack over a paper towel, and let cool before glazing. 7. Prepare the glaze, recipes follow. 8. Glaze the doughnuts, cover them with sprinkles, cover the doughnuts in powdered sugar, or do a mix of each. Enjoy! 1 ½ cups (150 grams) confectioners’ sugar, sifted to remove any lumps. Place the sugar in a medium bowl and slowly stir in the milk and vanilla, a little at a time, to make a smooth pourable glaze. Sift together the sugar and cocoa powder in a medium bowl . Slowly stir in the milk and vanilla, a little at a time, to make a smooth pourable glaze. So gorgeous! Fresh, beautiful doughnuts is something I’ve missed. My favourite type would be the freshly fried mini ones, covered in cinnamon sugar which we always used to get at the Stampede. The smell is so heavenly, I have to steer clear of that area of the Stampede during that time of year. Gorgeous doughnuts, Kamran! I must admit that I do have a secret love for the holes. :) Mmm. Funny, I think a lot of us are all a-Twitter for doughnuts for some reason. I bought a doughnut pan a couple of weeks back and it still hasn’t been used. 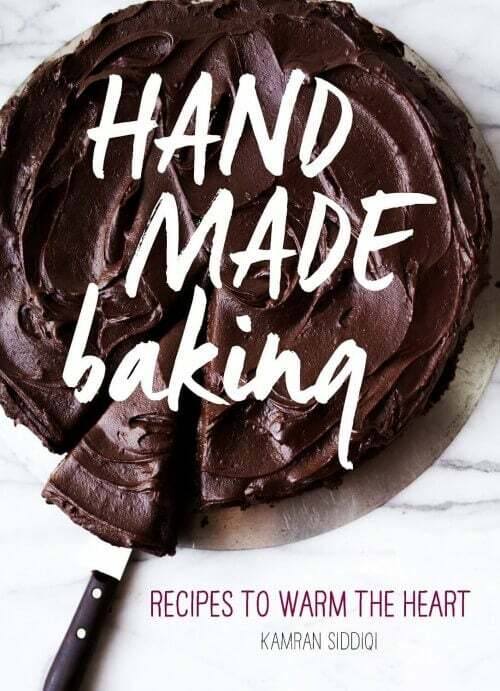 I’m just wondering, does the cookbook have baked batter-based doughnut recipes? Oooo They look great! I’ll have to try these before the week is out! I’ve had doougnuts on my to-make list for the longest time! Somehow it keeps getting pushsed back because delicious donuts from the bakery are just minutes away. I’ve got to change that, I know. Your doughnuts looks amazing! And my favourite doughnut has got to be the nutella filled one. Bliss. 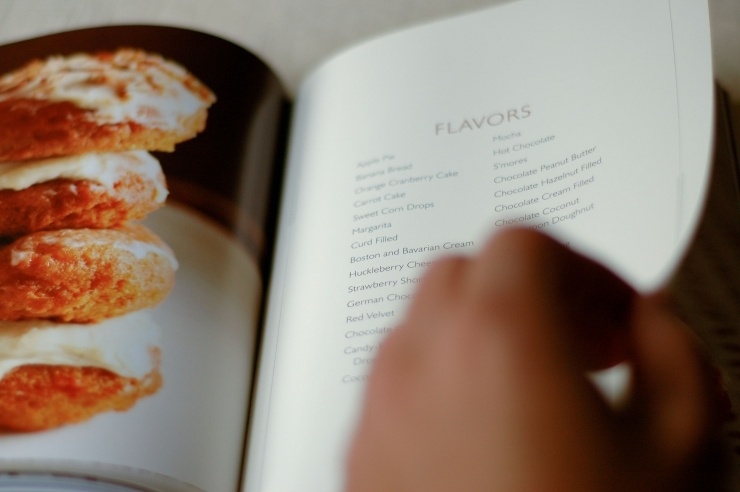 The pics are awesome .. yet again :) I wonder if there is a recipe for baked donuts in that book. I love yeast glazed doughnuts! They are sweet, light, and oh so delicious! Love Lara – Love her book! My favorite doughnut is a warm doughnut. Preferably with a simple sugar glaze. Vague, but the absolute truth. Choosing a favorite donut is a difficult task, but Boston Kreme is pretty up there! It’s dinner time here in Tokyo, but these doughnuts look perfectly delicious for any time of day! Beautiful job, Kamran! Fab post Kamran! My favourite doughnuts (though I don’t really like to eat them – I just like a bite, so the doughnut holes are perfect for me) are the glazed ones with multicoloured sprinkles. First time visiting, like your blog and recipes. and these doughnuts are so delicious, I specially love the sugar glazed doughnuts. And my favorite is the good old sugar donut. Mine is either the colorful sprinkly one [appeals to the young girl in me] or the chocolate hazelnut filled chocolate glazed doughnut!! Sounds sinful, right? When I was a kid I loved apple fritters, mainly because they were the biggest donuts in the case! Now I live in Japan and love the donuts from a donut store chain here named Mr. Donut. My favorite is called pon-de-ring, and is a ring shaped donut that looks like eight donut holes cooked together into a ring. The inside is soft and chewy, unlike any donut I’ve had before! Recently they have also had the “German Chocolate Coconut”, a chocolate cake donut coated in toasted coconut. This may be my new favorite! I would love to try making my own donuts, this recipe looks fun! Beautiful pictures! I love cake doughnuts the very best now that I’m older, but as a child I loved the plain glazed doughnuts. When I was a child back in the 1950’s my family lived way out in the country. We used to make a trip to town to get supplies of various kinds on Saturdays. My mom and I would always stop at this little house where they made and sold doughnuts. We would buy a dozen and Mom and I would sit in the car eating them all up. They were always warm and sticky yeast doughnuts. They were great. My favorite kind would be the regular glazed donuts, topped with something like raspberries. Mmmm. Gorgeous doughnuts, Kamran! And my favourite has got to be the sugar glazed doughnuts. Bliss. Oh baby! I am a cider doughnut girl, through and through. Cake donuts are by far my favorite. Apple and Pumpkin are so good! Your doughnuts are absolutely gorgeous! I made yeast raised doughnuts a couple months ago, and have made a few other kinds since then. My favorite are simple, glazed doughnuts, cake or yeast. Chocolate cake, or raised with white sugar…or raised with chocolate…I’m not picky! 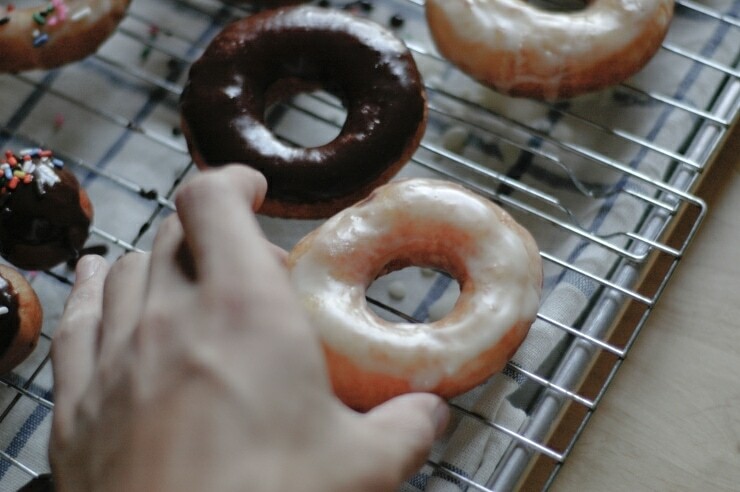 Oohh, definitely a raised chocolate glazed doughnut…nothing beats it! My favorite doughnut has to be the baked double-chocolate glazed beauties I made yesterday morning! We’ve been sticking to baked doughnuts on account of the wee little one in our house, but after your gorgeous photos and rave recipe review, I see some raised doughnut holes in our very near future (my birthday = pass on fried foods). It has to be chocolate glazed with rainbow sprinkles.. It’s the kid in me! My favorite donut is a chocolate glaze old fashioned. Crispy. Delicious. Hey Kamran, now I want a donut instead of my virtuous breakfast of granola! I have made beignets, which are my favorite donuts, although I do have a fondness for raised glazed donuts with all that puffy yeasty goodness. Ever make a strawberry glaze? You use berries instead of milk. I hope you make the krullers again, I would love to see our pictures of them. I like a doughnut coated with sugar and cinnamon! And still warm! This looks like an awesome book! Yum! These look delicious and your pictures are gorgeous! My favorite type of doughnut would have to be just a plain ol chocolate glazed doughnut. Yum!! Beautiful Kamran. Now I want a doughnut! If I had to choose a doughnut it would be one with chocolate/nutella filling! Your doughnuts look amazing! I personally love apple cider doughnuts. The signify fall to me, and eating them tossed in cinnamon sugar when they are hot out of the oil makes me feel warm and happy. I love chocolate cake donuts with vanilla glaze. Boy, are they good! Toasted coconut. Def toasted coconut. Your donuts look delectable. Yum! Who needs Krispy Kreme when you can make these gorgeous babies at home! Glazed old-Fashioned dipped in Chocolate Milk!! doughnuts hold wonderful memories in my life, too. every year, for nearly 20 of them, we got together with our friends and their families and had a pumpkin carve and doughnut fry. my specialty is maple bars, but i also make pumpkin doughnuts as well as the apple cider doughnuts. one memory that stands out: when i was a kid in arizona, we used to get our polio shots at the school. on immunization day, my mom knew it but wouldn’t tell us because i freaked out. she always had a surprise for us to make the day a little easier…at lunch time we had fried shrimp for dinner, but after school, she made mounds of delicious glazed doughnuts that she made with potatoes. yummy. i don’t make those and i think mine are better, but it was a delightful memory. i’m anxious to try these doughnuts and would LOVE to win Lara’s book! Thanks for the post! yum! My favorite type of donut is creme filled, not custard but creme. yumm! Holy cow. My favorite doughnut? Do I have to narrow it down? I even have a line of bumper sticker ideas in my head involving doughnuts…..
My favorite has to be a NY jelly doughnut. I’m a simple girl… I love good old glazed doughnut holes, but maple glazed long johns are a close second. Darnit…now I want a doughnut! I worked at a bakery in my hometown for 4 years. It was my first job and I loved it. The bakery has been open over 100 years so you know the doughnuts were amazing. My personal favorite are the plain glazed raised doughnuts from that bakery. They are seriously perfection and I have not tasted a doughnut since that compares. YUM! My favorite is definitely the cream filled, but I can’t leave out my maple long johns either. Glazed with chocolate icing! But you also can’t beat a classic – a warm, glazed doughnut! I like a whip cream filled glaze doughnut. This cookbook looks great! Cake doughnuts but a big old smile on my face! I love that they are so different from regular doughnuts! Yum! Stumbled onto your blog from a comment of yours on another, and glad I did — you have gorgeous photos and recipes! Crullers are very big in Wisconsin, where I’m from, but my favorite doughnut is a hot, plain cake doughnut… maple-glazed doughnuts a close second. My favorite doughnut is an apple filled one. I am buying that book tomorrow. Tomorrow, you hear? Donuts. Wow. Amazing. Thanks for the inspiration, Kamran – beautiful work. Pastry cream filled vanilla doughnut. Yum. My favorite is a chocolate cake donut but these look yummy!!!! Wow… Those doughnuts are absolutely stunning!! Baking doughnuts is something I’ve always wanted to do, but never been brave enough to try. Your doughnuts look amazing! So I might have to indulge in making some soon. My favourite doughnuts are old school raspberry jam filled and rolled in icing sugar. Tasty tasty! Blueberry Cake Doughnuts are my absolute favorite, with chocolate glazed yeast doughnuts in a close second! 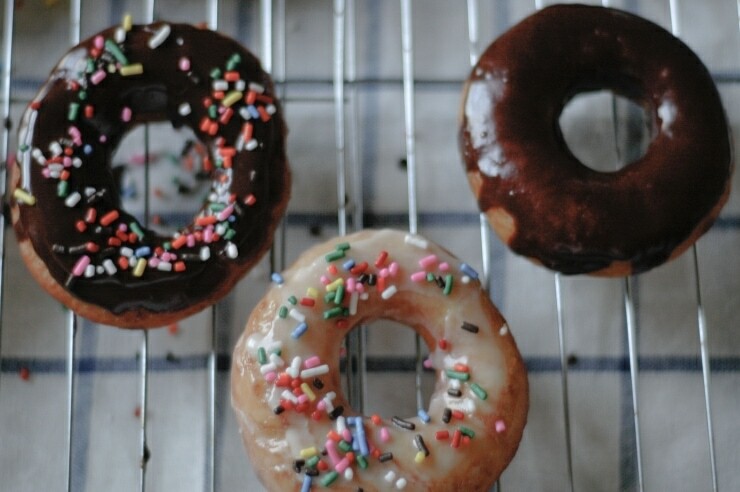 My favorite is a chocolate glazed doughnut…yum….I would love to be able to make them myself! it changes depending on my mood but I can always go for a plain glazed filled with raspberry jam! You mean there has to be a favorite? I can’t tell you my favorite part, but I can tell you my least favorite part – the empty plate they leave behind and the yearning I am left with for more! Can’t wait to try these! And, as for favorite doughnuts, mine would have to be the cider doughnuts that my local apple orchard sells. Mmm, mmm. My favorite would have to be just a plain glazed doughnut hole. Perfect to just pop in your mouth on the go. My favorite doughnut might be a New York Cheesecake doughnut from our local shop but I love doughnuts from our cider mill too. my fav donuts have to be the chocolate donuts with sprinkles!! Just found your site via Joy the Baker, and I can already tell I’m going to be visiting it a lot. My favorite doughnut (I realize this is highly specific) is the maple-iced cake doughnut made at Wall Drug, in Wall, South Dakota. I like maple anyway, but those are the best I’ve had anywhere. My favorite always has been apple fritters, though I am also a sucker for “long johns” – an eclair-like donut filled with vanilla pudding and topped with a chocolate glaze. I haven’t had either in longer than I can remember, and I’ve never made any kind of donuts at home – so I could really use this cookbook! Hi Kam, My son is a huge doughnut fan but I’ve been reluctant to try because of fear of failure (lol). But yours look pretty awesome. Congrats!! Oh Kamran, why must you tease me with these doughnuts. Now I want some for a midnight snack. As for my favorite…I’ve always been a glazed kind of girl, but I do like a custard filled on every once in a while. my goodness. donuts!? from scratch!?!? my favorite donut is a chocolate cake donut with simple sugar icing. with black coffee. mmmm. Fresh blueberry donuts are my favorite. Robin– Hey there! And thank you for your kind words! I’m glad you like it. Also-what’s the name of the orchard? I’d love to get my hands on some of those cider doughnuts! Jenn– I’m with you on the bavarian cream- they are great every once in a while! Is there a flavor I don’t like? I Love them ALL. Glazed, Chocolate Covered, Caramel glaze and Chocolate Covered with Bavarian Cream Filling to start. Blueberry ,Maple, I could go on and on. Thanks for the giveaway. Would love to have that cookbook! Oh my goodness. Those look lovely. My friend and I were just talking about having a doughnut party! My favourite would have to be homemade maple glazed doughnuts… like Mama makes. My favorite donut of all time is the plain glazed donut from Donut Villa in Malden, MA – it is a small shop owned and run by a 60 year old Greek man and his family, and they are the most delicious-melt-in-your-mouth-oh-my-god donuts you have ever tried. My favorite kind of donut is a raised custard-filled donut with chocolate frosting/glaze. They remind me of Boston Cream Pie! A close second would be a fresh glazed donut with a great cup of coffee! I absolutely love this. I am seriously wanting to make 1000 glazed donuts every morning when I wake up. Oh my goodness….they look divine! I love chocolate cake donuts! My favorite doughnut would have to be an old fashion or maple bar. 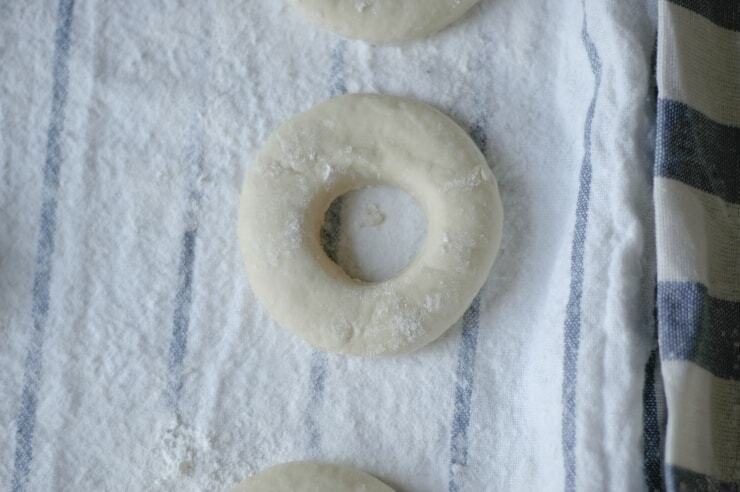 Your raised doughnut recipe looks wonderful and I think I will try it this weekend. Maybe I will have a new favorite next week! Just recently I’ve been craving doughnuts ALL the time. I need to buy this book! Your pictures are so pretty and your doughnuts look fantastic. Wish I was there to try one! Oh goodness. At home the local bakery makes the BEST kruellers. I would absolutely die of happiness be able to make them myself. I, too, am crazy for doughnuts. With Halloween coming, I think these would be great to serve with apple cider. I’m also thinking I might substitute apple cider for the milk in the glaze. Yum! Plain glazed doughnuts are my favorite. Preferably warm. Mmmm! Your doughnuts look so yummy! I am way too scared of deep frying things though! I love cinnamon and sugar doughnuts! And sugar and been obsessed with eclairs lately. I have never made doughnuts before (or deep-fried anything), so this book would be a great step forward for me. My favourite doughnut is a French cruller, hands down. I can’t get enough of the airy interior. An old fashion glazed donut can’t be topped except with CHOCOLATE! YUM!!! My next favorite would be a Blueberry Cake Donut. Yummy. My favorite are the glazed with chocolate topping. I’ve never tried making doughnuts before, but the pictures are inspiring. I love them all!!! But my favorites would have to be: chocolate glazed, lemon curd filled, and spiced cake. The book sounds amazing! My favorite doughnuts will always be coconut cake doughnuts. Yum. Beautiful post! My favourite doughnut is custard filled. That texture! i will refrain from using adjectives, to keep this PG. Your post has made me want to make some – my first attempt. Ohh man, looks so good! I’d have to say, my favourite is either honey glazed or the French crueller. Though, I haven’t had too many flavours. Just recently, I made pandan flavoured doughnut holes and those were pretty good! I loved the color the most! Brown on the inside, but a vibrant green on the inside. Between cake or yeast risen, I think I prefer the fluffiness of a yeast doughnut a little bit more. My favourite is zeppoles or zapplas, fried heavenly Italian doughnuts! They are simple, easy and taste wonderful. My favorite doughnuts are probably apple fritters. The perfect treat for fall! So many doughnuts, so much love for doughnuts, how can I pick just one? If I had to go with just one doughnut, it would have to be chocolate glazed doughnuts, yum! My favorite is definitely sour cream.. that thick dense crumb, crisp on the outsides but moist and tasty on the inside. man. i’m gonna have to go out and get one. i can feel it in my bones. Potato doughnuts on Fat Tuesday was the tradition in my family – apparently a Pennsylvania Dutch tradition. Probably still my favorite. your photos are fantastic. i love the soft light. and beautiful doughnuts. i am partial to old school unglazed cake doughnuts. so good. I love a plain glazed doughnut with sprinkles. Yum! oh these look sooo good! My fave is still the simple cinnamon sugar coated doughnut when they’re piping hot and the grease makes the paper bag see through.. always reminds me of when I was little and went to the royal show with my dad; we’d find a stall and share a bag of 6…. sigh…. I love a simple fried doughnut with a light sugar coating. My mom used to make them for us when we were little. Sweetness! Absolute deliciousnes! I feel your love of doughnuts and understand completely. I wish I could eat them everyday! Who wouldn’t love a whole book about donuts. everyone’s on a doughnut frenzy! these look so delicious! My favorite doughnut would be the chocolate frosted ones with the vanilla cream filling. its perfect haha. A glazed donut topped with chocolate icing. Like Audrey Hepburn, a classic. Ps- I do see the giveaway was in October… but very happy to recall those chocolate cream doughnuts nonetheless! Thanks and looking forward to future posts. Krispy Kreme doughtnuts are the best!!!!! Is there a simple change I can make to this recipe and endup with choclate doughnuts? I made these doughnuts just a month ago. And everything was going well, the step that really ruined my almost perfect donuts was Step 3. I think that temperature for the oil was too high. When I placed my doughnut in the oil they would turn black in 2 seconds, and completely raw in the middle. 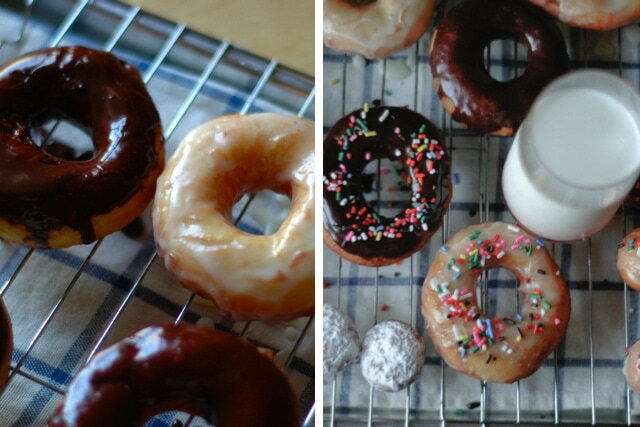 I tried many doughnuts and they still turned out the same, so guys lower the temp of the oil. I couldn’t resist commenting on this post, seeing as it’s National Doughnut Day and doughnuts are my absolute favorite food. Your version looks so light and airy… and that glaze? I need a straw. You are the sweetest, Kelly! If I remember correctly, I dipped the doughnuts in the glaze a couple times. Now, with all of this doughnut talk, I think I could go for one (or a dozen!). I love these donuts very light and delicious. Made a lot of them but this is my new go to. Used mexican vanilla I just got shipped to me. Karman, Do you have a post with the recipe for the Cruellers?